In 2017, The Association for the Soldiers of Israel - Canada provided its friends and donors with a powerful evening of moving personal stories, IDF musical talent and exclusive commentary on the current regional situation. Keynote speaker Major General Michael Edelstein treated the participants to his unique perspective as Israel's Defense Attache to the United States. In addition to the keynote speaker and performances by the IDF Musical Ensemble, attendees were inspired by the personal stories of army life from an IDF colonel and Master Sargeant. In 2016, ASI-Canada delivered a moving and powerful concert event at the Toronto Centre for the Arts. The highlight of this stirring event was the keynote address delivered by former IDF Chief of Staff, Benny Gantz. As a lively and talented speaker, Lieutenant General Gantz led the audience on a powerful journey through the current situation in the region, life in the army and the need for ASI-Canada, our friends and donors. The IDF Musical Ensemble treated the audience to a brilliant and moving perfomance. Additional hightlights of the evening included extremely inspiring presentations by an Elite soldier in the IDF and the Head of the IDF's Trauma & Combat Medecine Branch. In 2015, ASI-Canada delivered a highly informative and inspiring evening. The event's keynote speaker, Colonel Grisha Yakubovich, Projects Director at the Coordinator of Government Activities in the Territories, provided a rare snapshot of the economic realities and strategies that inform Israel's drive for peace. Along with a stirring performance by the IDF Musical Ensemble, the honoured representatives of the IDF shared their personal stories of life in the IDF and the role ASI-Canada plays in their day-to-day lives. In 2014 ASI-Canada delivered a moving and powerful concert event at the Toronto Centre for the Arts. 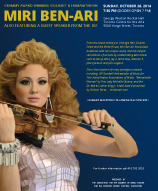 Featuring Grammy Award-winning violinist and humanitarian, Miri Ben-Ari, the concert thrilled audience members who had gathered to celebrate Israeli talent and raise funds to enhance the lives of the brave men and women of the IDF. In addition to the performance, attendees were inspired by the personal stories of army life from a captain in the medical corps and a combat soldier with the K9 Unit at Oketz. The deeply informative keynote address was delivered by the Director General of Israel's Ministry of Strategic Affairs. The Young Leadership of ASI-Canada are becoming well-known for their impressive events that bring young professionals together to network with each other and to hear from visiting Israel soldiers. In 2014, approximately 100 young Torontonians were treated to inspirational tales of valor from a captain in the medical corps and a combat soldier with the K9 Unit at Oketz. This Gala Dinner broke all records in ASI-Canada's history, raising nearly 2 million dollars toward a multitude of projects to benefit the soldiers of Israel and their families. The Gala Dinner featured a keynote address by Ilan Biran, former Chairman of Israel's Rafael Advanced Defense Systems, developers of the Iron Dome and the inspiring personal stories of two army officers. The IDF Ensemble gave a wonderfully energetic and inspiring performance. Once again ASI-Canada broke with tradition and offered our donors a new and innovative format for the program portion of the evening. ASI Board Member Barry Zagdanski interviewed Ezra and Nurit Eini on the loss of their son, Moishale, who was killed while serving in the IDF. The Head of the Doctrine Department of the Combat Engineering Corps inspired us with his words. The keynote address belonged to Israel's first female Major General, Orna Barbivay, Head of the IDF Personnel Directorate. The IDF Ensemble gave a moving and memorable performance. The Gala Dinner in 2011 was another runaway success for the organization, with record-breaking attendance and over a million dollars raised to benefit the soldiers and families in Israel. Among the highlights was the keynote address from Israel's Major General Amos Yadlin. Captain Shiri Cohen and Sargeant David Sperring shared their experiences serving in the IDF and the myriad ways in which their lives have been improved by the projects of ASI-Canada. Guests were treated to the songs of the IDF Musical Ensemble and danced the night away to the sounds of the Sole Power band. 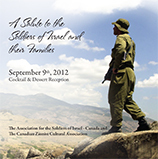 In a break with tradition, in 2010 the Association for the Soldiers of Israel - Canada and the Canadian Zionist Cultural Association hosted a cocktail reception event. With a flawless multi-media presentation and featured speakers, the audience was treated to a high-level insider's view into the current situation in the Middle East. Among the highlights was the keynote address from Israel's Vice Prime Minister and Minister of Strategic Affairs Moshe Ya'alon. The Nachal Infantry Brigade Commander and the Head of the IDF Casualties Department also provided deep insight into the welfare and well-being programs of ASI-Canada and CZCA, their implementation and impact on the families and soldiers in Israel. 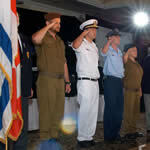 Projects and programs geared toward the Nachal Brigade "Adopt-a-Brigade" program were also highlighted. Guests enjoyed the wide variety of cocktails, hors d'oeuvres, treats and desserts served at the Beth Tzedec Synagogue. Major donors and supporters of the ASI-Canada and CZCA gathered the evening before the 2010 Gala Event for an intimate discussion with Israel's Vice PM and Minister of Strategic Affairs Moshe Ya'alon and additional VIP IDF guests. Guests were treated to a frank and open discussion about current and future challenges facing the State of Israel and the Middle East. In addition, guests were privy to exclusive and informative presentations from visiting Nachal and IDF Casualties Department commanders. 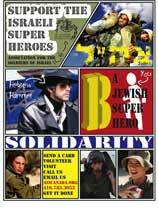 The "Adopt-A-Brigade" Nachal campaign was launched at a beautiful reception and information presentation. The IDF attache to the Marines, who is a former battalion commander with the Nachal brigade provided insider information to the donors and supporters gathered, while a welfare officer illustrated the gratitude and impact felt by the recipients of ASI-Canada and CZCA projects in Israel. Details of the current projects pursued by the organizations were presented by Chair Henry Silberman. 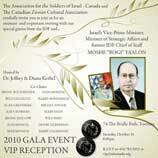 Breaking all previous records on attendance, the 2009 Gala Dinner for The Association for the Soldiers of Israel-Canada and The Canadian Zionist Cultural Association brought more than a thousand people together to honour the brave men and women of the IDF and their families. The evening featured speeches by a high ranking officer in the Air Force, who was also the first female officer in her field, a commander of a tank brigade and the commander of the Sayeret Golani. In addition, traditional and contemporary music was performed by the IDF musical ensemble. This Gala Dinner also saw the launch of the annual ASI-Canada and CZCA yearbook, hightlighting the organizations' projects, news and events and featuring full colour photographs from Israel. 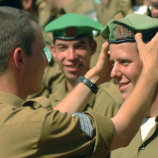 For 2008, the Canadian Zionist Cultural Association (CZCA) and the Association for the Soldiers of Israel (ASI-Canada) joined with various schools around the GTA to bring some warm holiday wishes to the men and women in the Israeli Defense Force. These students spent the season filling up cards, provided by the ASI and CZCA in hopes that a greater sense of solidarity can be instilled between our youth and the youth of Israel. If your school, youth movement or synagogue is interested in organizing any activities or events that aid soldier well-being, we would be happy to support your efforts. So what are you waiting for? Are you a Super Hero? 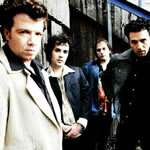 Finally, Knesiyat Hasechel, Israel's most talked about Alternative rock band came to Toronto! It was a great musical experience. The band mixed its rock base with new age together with musical influences from Israeli motives, evolving into a phenomenal adventure into Israeli life. Profits from VIP ticket purchases were donated to The Association for Soldiers of Israel- Canada and The Haifa Foundation. October 27th, 2008 at The Mod Club. The Association for the Soldiers of Israel - Canada and The Canadian Zionist Cultural Association presented the Annual Gala Dinner.